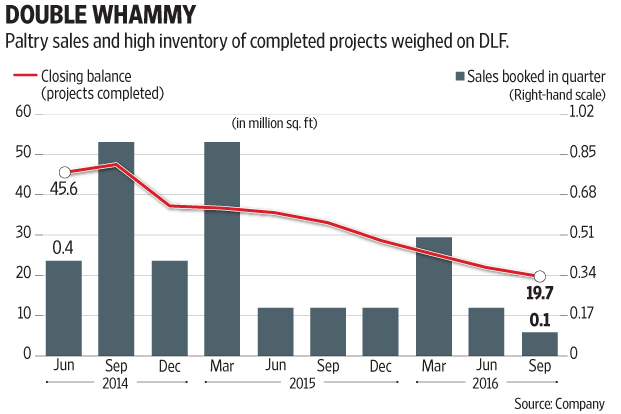 DLF Ltd’s woes did not ease in the September quarter, in spite of tall expectations. Residential unit sales were few and far between even as commercial leasing activity remained flat. The quarter’s net consolidated revenue at Rs2,226 crore just matched the year-ago period’s figure. The big concern is the continuing gloom in sales. With absolutely no new projects launched over several quarters, sales too have been moving downhill. The company sold 100,000 square feet (sq. ft) in the September quarter compared to 200,000 sq. ft in the year-ago period. Demonetization is likely to delay recovery in the real estate sector and may even lead to contraction in sales in the near term. This is not good news as it constrains cash flows for the behemoth that is strangled with a Rs23,530 crore net debt— inching up every quarter. Interest outflow continues to remain at heady levels—Rs735 crore in the September quarter, almost the same as a year ago. Meanwhile, another big disappointment is that the deal to sell 40% of its stake in the commercial entity has been further delayed. This was expected to deleverage DLF’s balance sheet and ease the interest burden. The management feels that it should reach fruition in the March quarter at the earliest. Investors, however, must take cognizance of the dull real estate milieu in the country at present, which may impact valuations and therefore delay proposed transactions. Certainly, the company has done its best to trim costs. September quarter’s construction cost comprised about a third of the revenue. Hence, operating profit was maintained at the year-ago level. But then its huge interest burden chews up most of its Rs1,020 crore of operating profit, leaving no room to repay debt. Existing inventory (September quarter) was about Rs16,860 crore, which would mean that existing unsold projects are also weighing down on the balance sheet. The company’s closing balance of completed projects in the residential segment is at 19 million sq. ft, which is slowly receding. DLF’s consolidated net profit held out at the year-ago level of Rs206 crore. On Monday, the stock closed 1.6% lower on BSE on weak performance, the gloom of demonetization and uncertainty about future sales. Besides, the management had nothing concrete to assure investors with even on the stake sale.